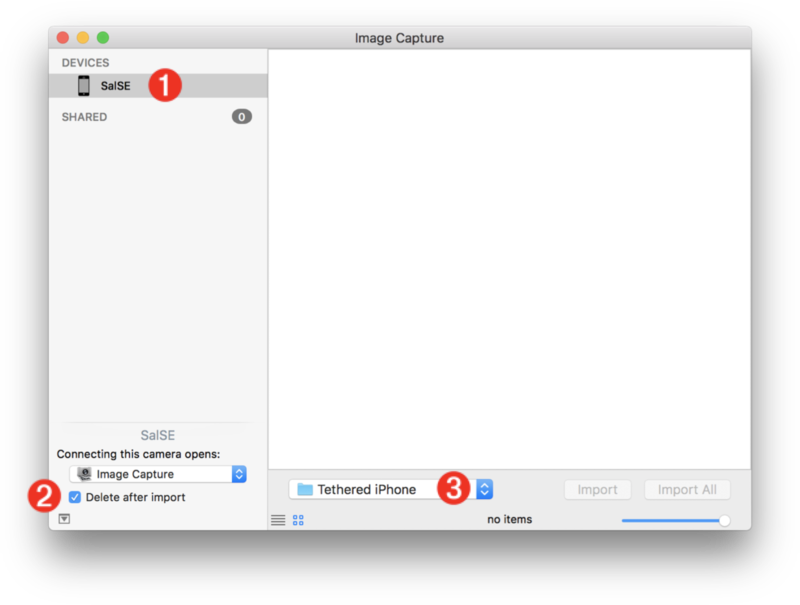 The ability to capture images from a tethered iPhone is not currently supported by the Photos application in macOS. However, using the native user-automation support in macOS, it’s easy to create an solution for automatic import of images taken by an iPhone tethered to your Mac. The automated import workflow requires a specified folder to temporarily hold the image files downloaded from the tethered iPhone. 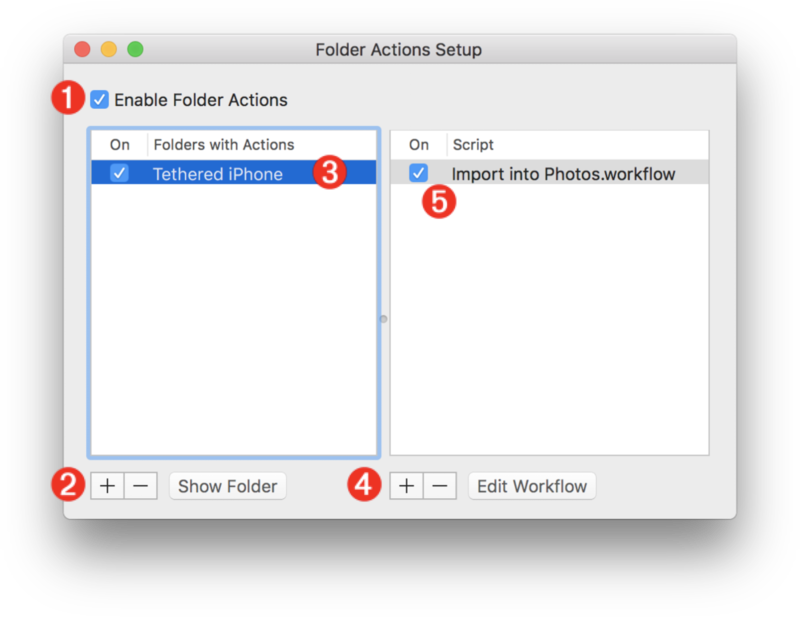 The process of importing an image file downloaded from the tethered iPhone, will be performed by the provided Automator Folder-Action workflow. This workflow will be “attached” to the directory you’ve identified as being the import destination in the Image Capture utility. When an image is downloaded into the attached folder, the workflow will be executed using the downloaded file to import it into the current Photos library, and then move the downloaded file into the trash (since a duplicate of it was placed into the Photos library during import). DO THIS ► Press the “Done” button. 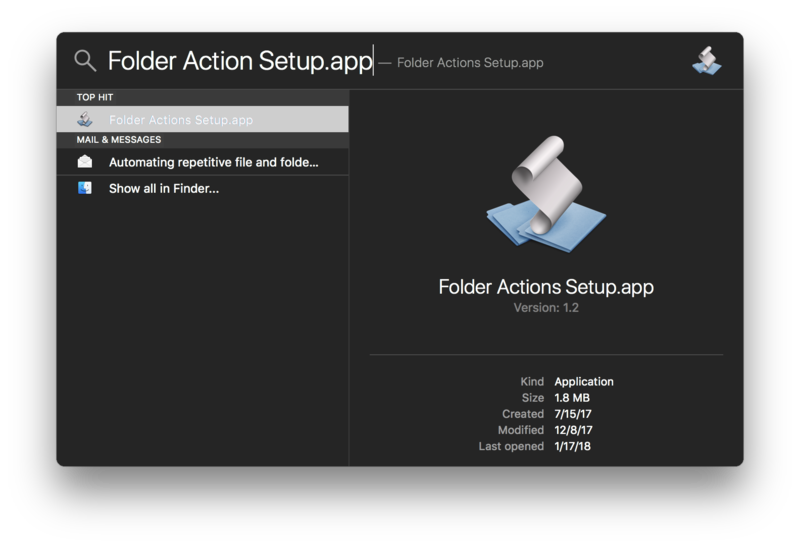 Now that you’ve installed the Automator workflow, it can assigned as a Folder Action using the Folder Actions Setup application. DO THIS ► Type Command-Spacebar (⌘Space) to summon the Spotlight search field, and enter: “Folder Actions Setup.app” then select the app from the results list and open it. 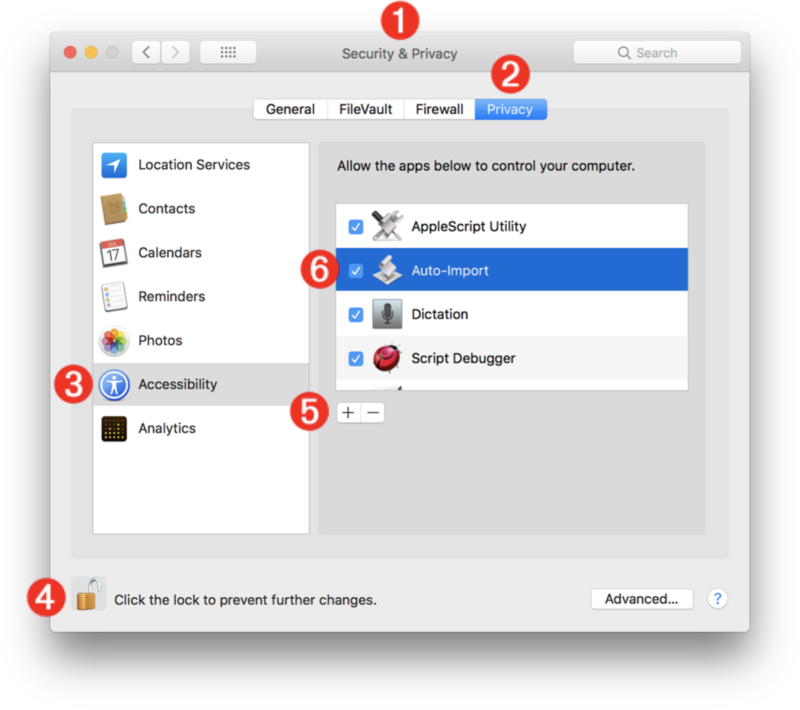 The Folder Actions Setup application is used to turn on|off the Folder Actions architecture and to assign folder action scripts or workflows to chosen folders in the Finder. Turn on Folder Actions system-wide by selecting the checkbox labeled “Enable Folder Actions” 1 at the top left of the window. Choose a folder to attach a script or workflow to by clicking the plus button (+) 2 at the bottom left of the window. A folder picker sheet will drop down. Navigate to the Pictures folder and select the newly created import folder named “Tethered iPhone.” Once chosen, it will appear in the list 3 of currently watched folders. To choose the script or workflow to assign to the folder, click the plus button (+) 4 at the bottom center of the window, and from the drop-down sheet list, select the workflow you installed, named: Import into Photos 5 which will now appear in the list of assigned actions for the selected folder. Quit the Folder Actions Setup application when done. The process of triggering the importation of a taken photo into Photos is accomplished using an AppleScript “Button-Watcher” applet. This applet when launched will stay open and running in the background as long as the Image Capture application is running. If you quit Image Capture, this applet will automatically quit as well. Is Image Capture the frontmost application? Is the “Import All” button in the Image Capture window enabeled? If the answer to both of these question is Yes (true) then the script applet will “press” the Import All button in the Image Capture window, thereby downloading the taken photos to the chosen import folder, and triggering the Automator Folder-Action workflow to import the downloaded image files into Photos. DO THIS ► DOWNLOAD the Button Watcher AppleScript applet. The Auto-Import script applet uses the Accessibility architecture in macOS to query and control the interface of the Image Capture application. For security reasons, doing so requires approval from the user. Obviously, the first step is to connect your iPhone with a USB cable to your Mac. Make sure the camera app is active. IMPORTANT: make sure the photo library on the iPhone is EMPTY. If you need to, DOWNLOAD or BACKUP the current images and movies, and then delete them from the iPhone prior to using it for tethered capture. Launch the Image Capture utility (Applications folder). With the iPhone connected 1 select from popup menu at bottom center-left of the Image Capture window 3 the import folder you attached the Folder-Action workflow to. IMPORTANT: select the “Delete after import” checkbox 2 so that the camera will be cleared after each triggered import. Launch the Auto-Import applet, and click the Start button. Bring Image Capture to the front by clicking in its window. You are now ready to do tethered capture. IMPORTANT: As long as the Image Capture application is in the front of all other apps, the applet will continue to click the “Import All” button in the Image Capture window when it is active. If you choose to make the Photos application the frontmost app (perhaps to edit a photo), the applet will pause until you move Image Capture to the front again. If you quit Image Capture, the applet will quit automatically as well.